Home › Academic Research › Africa Travels, Africa Writes. Notes on African Intellectual Mobilities. Typically Africa has been framed as a destination, not source, of travellers. Also it has been taken to be the subject, not origin, of texts. Travel and movement of Africans are too often pathologised by the West. And conceived of en masse. Individuals and their stories get caught up in the nets of catch-all terms with negative connotations like migration, brain-drain, or displacement. Struggles over mobility are in many ways accentuated when it comes to Africa; Ebola has not helped, as Achille Mbembe has reflected. Africans and the black diaspora talk of challenges they can face when on the move around the globe – subjects of profiling, prejudice, or the curiosity cabinet. The fine-tuned narratives of people across time and space too often get overlooked, but the voices are there to be heard, read, witnessed. Africans and their words and expressions have of course long travelled, and continue to travel in a multitude of ways. This abiding interest brought together researchers and writers in a recent colloquium on African Intellectual Mobilities at the University of York, UK, and its seminar series Finding Africa, in conjunction with Centre for Concurrences in Colonial and Postcolonial Studies, Linnaeus University, Sweden. 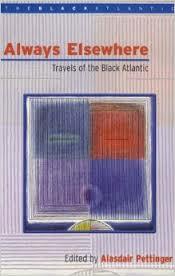 It acknowledged the growing attention given to the vibrant, but understudied, area of African and diasporic travel texts and contexts, past and present, rather than the more established critical arena of interrogating largely white travel accounts about black subjects and territories. The growing attention has come from diverse quarters and two key anthologies have served to highlight the depth and breadth of African travel and writing: Always Elsewhere: Travels of the Black Atlantic, edited by Alasdair Pettinger, the colloquium’s keynote presenter, and Other Routes: 1500 Years of African and Asian Travel Writing, edited by Tabish Khair, Martin Leer, Justin D Edwards, and Hanna Ziadeh. In 2014, the Africa Writes festival dedicated a panel to Broadening the Gaze, with a round-up of Ten Books for Your Shelf on African and African Diaspora Travel Writing. The historical shadow of forced mobility is of course deeply and widely felt. The transatlantic slave trade accounted for the greatest and most brutal of upheavals of peoples in history, and other forms of slavery transported Africans from the eastern seaboard and elsewhere. Importantly, writings and other cultural expressions have registered and arisen from involuntary or little-choice travel of all kinds, including abduction, escape, forced removal, indentured and migrant labour, asylum seeking, and exile. Yet, the colloquium emphasised the wide compass of African and black diasporic travel – its extensive and multivariate nature, and its under-recognised volitional forms. Trade, politics, education, mission, advocacy, work, tourism, entertainment, aid, education, and media are just some of the reasons and manifestations of African travel. The colloquium referenced a diverse range of ‘travel writings’: letters, journaling, journalism, biography, literary retelling, alternative guidebooks, performative literature, and more. Questions teemed. What can be constituted as African and diasporic travel writing? How do we understand black print cultures linked to mobility? What intellectual modalities are shaped by movement? How have black travel texts been imagined, communicated, consumed? 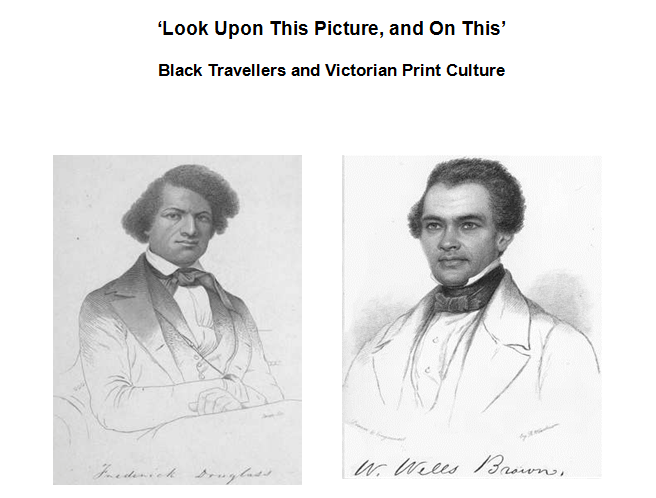 Frederick Douglass and William Wells Brown – Alasdair Pettinger’s keynote presentation. Alasdair Pettinger opened the colloquium with a window into the mid-19th-century travels and writings of African-American abolitionist visitors to Britain and Ireland, Frederick Douglass and William Wells Brown. These campaigners’ writings were read in relation to Victorian print cultures of the day and explored in relation to oblique references to other black travellers crossing the visitors’ paths. To what extent could these former fugitives who became prominent anti-slavery activists speak for others of African origin in the margins who left fainter traces in the historical record? The panel on African diasporic writing picked up on this chord of the outsider-insider dynamic. 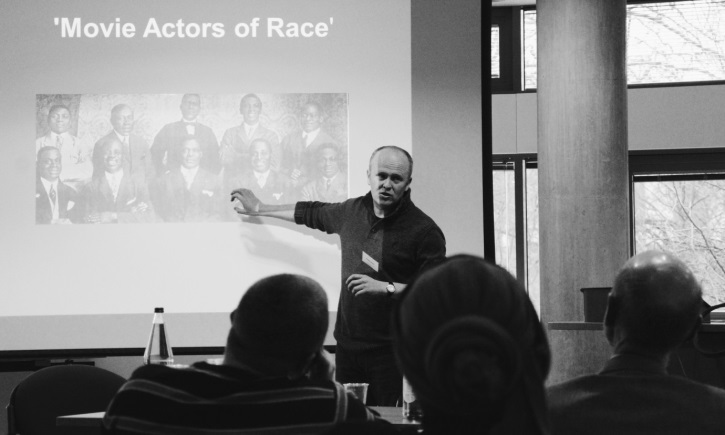 Robbie Aitken of Sheffield Hallam University offered insight into the surprising world of black Germany on the threshold of World War II through the eyes of visiting African-American journalists, while at the same time pointing to the limitations of their perspectives. Alan Rice, co-director of UCLAN’s Institute of the Black Atlantic (IBAR), surveyed the territory of Lubaina Himid’s stirring performative art. In Himid’s Guerilla Guidebook to an Alternative London and Paris she inserts African figures and iconography into European cityscapes to insist upon recognition of black presence in their pasts, presents, and futures. Tim Youngs, editor of Studies in Travel Writing and director of Nottingham Trent University’s Centre for Travel Writing Studies, took up Eddy L. Harris’s South of Haunted Dreams and the African-American motorcycle narrative. Was Harris’ journeying through ‘slavery’s old back yard’ on the iconic vehicle of self-determination freeing or magnetising? Moving on from diasporic mobility in Europe and America, the next panel focused on travel within and from Africa. Jo Davis discussed the profound socio-political contours of the travels and writings of Tiyo Soga (1829–1871), the first black overseas-ordained minister in the South Africa region. 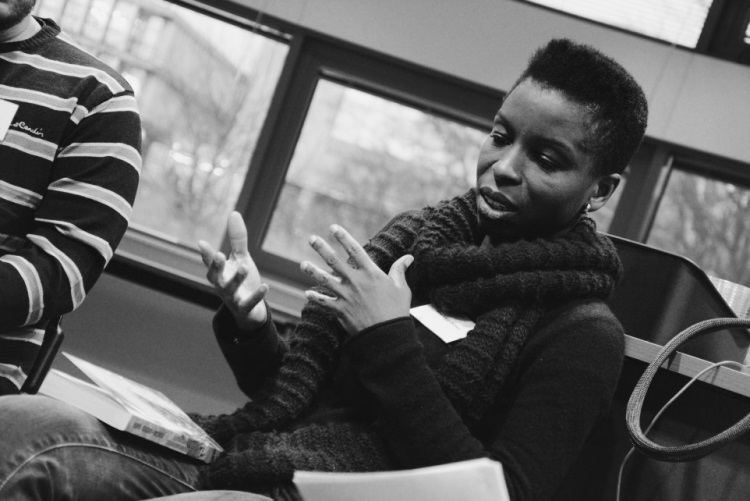 Africa in Words’ own Rebecca Jones, also of the University of Birmingham, challenged existing generic paradigms in her research journey on a literary history of Yoruba travel writing. Yvonne Reddick of IBAR opened up francophone Congolese travel writing on the eve of independence, illuminating the work of Paul Lomami Tchibamba and Antoine-Roger Bolamba. 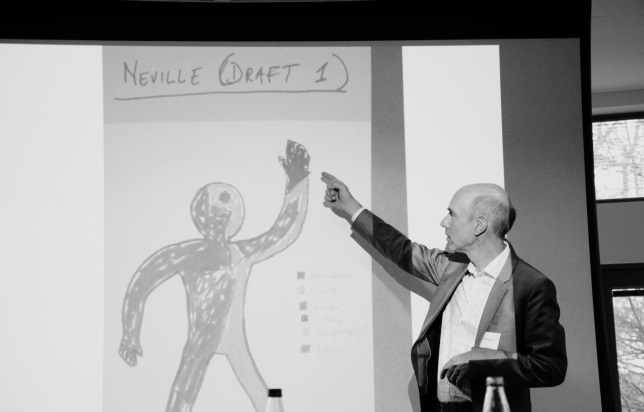 A consideration of African–European mobilities formed the final panel, with Stefan Helgesson of Stockholm University meditating on the geo-historical and psycho-social sedimentation of travel with reference to Neville Alexander and Nelson Saúte. How does language map mobility and how do different languages afford different types of mobility? Sanja Nivejsö, also of Stockholm University, explored the intriguing linkages between mobility and sexuality in relation to African narratives involving travel for education, covering texts by Tayeb Salih, Ama Ata Aidoo, and Phaswane Mpe. The final paper by Andrea Thorpe studied Peter Abrahams’ BBC-impelled Return to Goli, the controversial work of the exile writing back to London. The day ended on a fitting note with the words of the writer. Noo Saro-Wiwa read from her acclaimed Looking for Transwonderland: Travels in Nigeria (2012). She responded with generosity and forthrightness to a series of questions about the volume and her craft. The book emerged from her travels as an adult around the land from which she had become distanced in body and spirit as a child and adolescent following the execution of her father, environmental and political campaigner, Ken Saro-Wiwa. To colloquium’s co-organiser Nicklas Hållén’s question about how the book was received, she responded: ‘It is like two ends of a spectrum… almost like a sort of horse shoe spectrum – what people have against it, is exactly what people like about it…’. It does not pull any punches about aspects of Nigeria that the author finds alienating; nor does it engage in sentimentality in moments of admiration. Noo reflected that while she would not ever be in abeyance to any readership, she has become more aware of different lenses and perspectives. What will her next book be? No clues for us yet. But she says it’s bound to be less personal and emotional. She closes her book on Nigeria, finding more than she imagined in its diversity, depths, and contradictions. And she looks to new possibilities of the travel literature genre for Africans and the African diaspora, not least its women. The closing words by David Attwell, head of York’s Department of English and Related Literature, pointed to the provocative richness of all there is to be explored in the area of African intellectual mobilities and the supple genre of ‘travel writing’ by African and diasporic writers. There is much to be uncovered – and to challenge – in the past and present. Bryan Claxton looks to re-encounter black travels and texts triggered by war. Fatimah Kelleher calls for more writing through African eyes to map the continent. And we haven’t even started talking about the multi-directional mobilities and narrative experiments of new media and its creators. Janet Remmington is a scholarly publisher, writer, and researcher. An intellectual history of black South African travel and writing, c.1850–2010, is the subject of her doctoral research at the University of York. She is co-editor of a forthcoming edited collection to mark the centenary of Sol Plaatje’s inimitable Native Life in South Africa (1916). Nicklas Hållén is affiliated with Linnaeus University’s Centre for Concurrences in Colonial and Postcolonial Studies, Sweden, and a visiting postdoctoral fellow at the Department of English and Related Literatures at the University of York. His current work is on African diasporic travel writing. For more on African travel writing on Africa in Words, see our interview with Nigerian travel writer Pelu Awofeso, our round-up of intra-African travel writing, and our review of the Africa Writes travel writing panel ‘Broadening the Gaze’. Travel as Life: A Review of Route 234 « ktravula – a travelogue!